and a 14-day money back guarantee! 15 people, and we’ll contact you to arrange your event. Pay now to secure your all-inclusive discounted price and we’ll contact you to arrange your event. Can't find your city? No worries! Just submit the form below so we can get back to you with all your options and help you create an amazing team scavenger hunt! If you're looking for an immediate event, please email us at [email protected] and we'll get back to you with all the details. I can still remember quite clearly what it was like being a member of my local Youth Organization’s Soccer team at five years old. Bumbling around in cleats I would soon outgrow, part of an uncoordinated, fifteen child swarm chasing a ball in whatever direction it was kicked. I remember Coach Colton, who was kind, patient, and doing his best to organize that swarm into something more likely to score. Fast forwarding about a decade, I also remember well the time I spent as a defensive lineman on my high school’s Football team. This time led by Coach Funk, a less patient man who still deeply valued us, his players. He too was doing his best to turn us into a more effective whole, less a sum of parts. I never thought much of either coach’s efforts beyond how they affected my day to day (whether that meant bringing snacks for the team to share or running a monster mile on the bleachers) until I got much older and a boss of mine gave my team a speech that could have come from either of them. It was that in moment, during a speech on how we’re all in this together and need to maintain positive open communication, that I realized these men hadn’t just taught me how to play sports. They taught me to be part of a greater whole. The competitive spirit they fostered, the ability to count on my teammates, the desire to step up when they need to count on me. The importance of being honest, the importance of applying yourself and trying your hardest. All of these lessons have directly translated to my ability to succeed in the work force. Since that moment, I’ve made a conscious effort to apply those lessons to my professional life, and I urge you to do the same. The skills we developed playing sports as children are invaluable to being good teammates as adults. For more help bringing the team together, get everyone together and share an adventure. This is a nice and informative, containing all information and also has a great impact on this century new youth. Thanks for sharing it. Get team activities updates, team bonding ideas and tips to improve your comapny straight to your inbox! 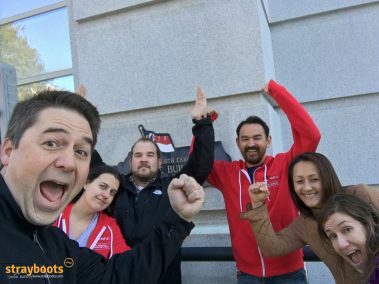 Strayboots' mobile scavenger hunts and team building activities provide corporations, students, and individuals with interactive team building experiences that are easy, fun, and unforgettable. Book Your Amazing Event Today! "Each and every team was engaged, and the feedback was outstanding – we accomplished everything as planned, and much more!" Join 10,000+ teams who are passionate about Strayboots.